The Cordyline Dancing Range features strappy foliage that is a very striking, has great variegation and matures to a different colour over time – This is very unique and is only found in the Cordyline Dancing Range! Cordyline Can Can features new strappy foliage that is a striking, bright variegation of pink on red, maturing to a complimentary mix of cream on green. 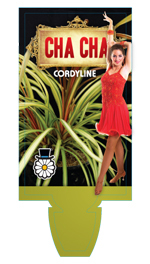 Cordyline Can Can is a dramatic new variety with colourful, weeping, variegated foliage. The ever changing colour of the foliage provides year round interest, and is unique to Can Can. Cordyline Cha Cha has young strap-like leaves that are a warm complementary blend of apricot and brown, changing as the leaves mature to a striking mix of yellow and green. Cordyline Cha Cha is a stunning new variety, with colourful, weeping, variegated foliage. The ever changing colour of the foliage provides year round interest, and is unique to Cha Cha. Cordyline Salsa is a stunning new variety, with colourful, weeping, variegated foliage. The young strap-like leaves are a vibrant mix of pink on red that deepen in colour as the leaves mature. The ever changing colour of the foliage provides year round interest, and is unique to Salsa. Excellent for mass display or as a feature in a decorative container. As the foliage matures the variegation changes to a brilliant yellow on deep forest green. The ever changing colour of the foliage provides year round interest, and is unique to Jive. 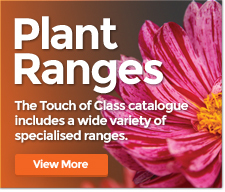 Excellent for mass display or as a feature in a decorative container.